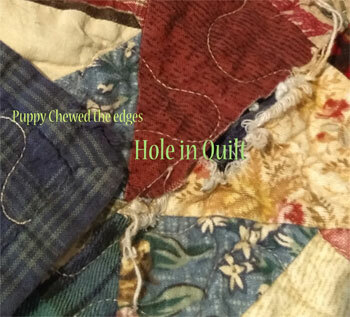 Oops, The Dog Ate My T-Shirt Quilt! Can it be repaired? Most companies will say NO!!! we won't fix that. What we do is take the quilting stitches out (much easier when the quilting isn't that 'scribble' quilting....) replace the offending block (you might have to provide a new t-shirt) . We then reload the quilt on the quilting machine and quilt the new area. This all takes time, and is not our most favorite task. While we do not want to be in the business of repairing quilts, we will repair a t-shirt quilt that we made, and for a reasonable price. In these two photos, the dog didn't eat it, but when it was laundered the old blanket they used in two of the blocks disintegrated! 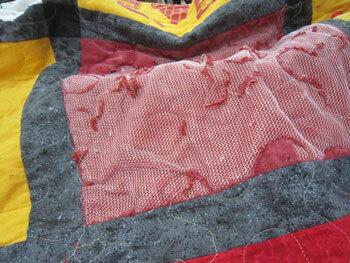 You can see inside the quilt, the and needle holes from where we removed the quilting. 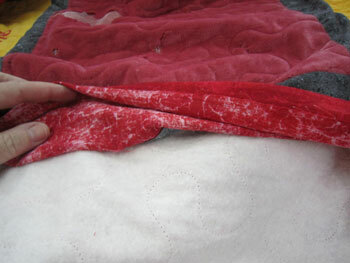 It is an easier job if the repairs on one of the sides of the quilt. Please note that we do NOT CHOP a big section of your quilt out to replace the injured area. As noted before, we are professionals and REAL quilters. We actually, undo all the hard work that we originally did, and replace the parts. You won't be able to tell we were there. After replacing the blanket squares, we added the new tees, then quilted it. Couldn't tell we had done any repairs after we were finished. Note: If the repair needs to be made in one of the borders or sashing, hopefully we will still have the fabrics in stock.